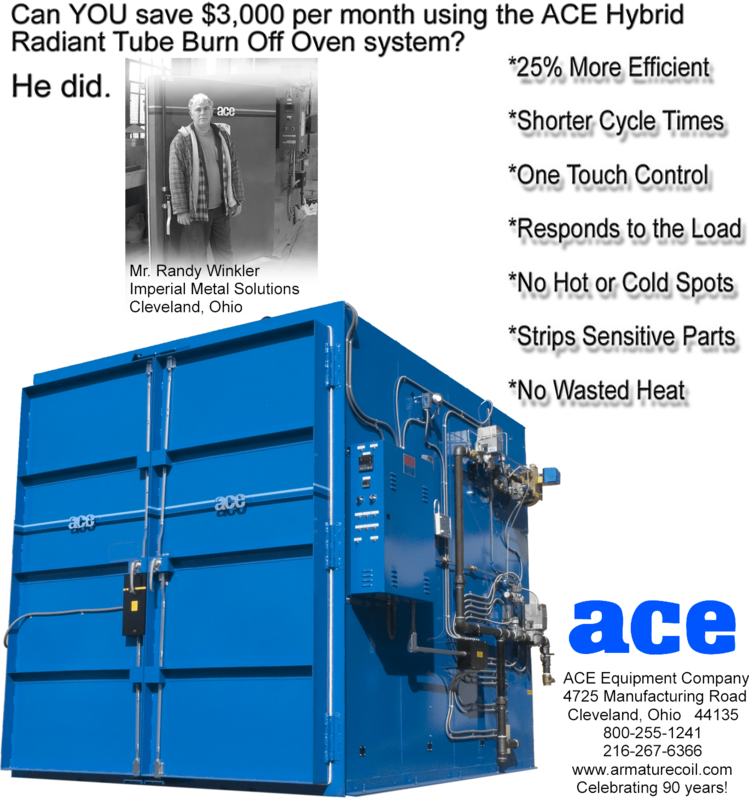 The new ACE (RT) Radiant Tube Heat Cleaning Ovens are big on performance and ultimate in energy savings. They offer astounding results while utilizing 20% less energy compared to convection heated Burn-Off ovens. Parts are loaded on a wheel-in cart and heated to 650° - 800°F (340° - 427°C). Here the combustible hydrocarbons decompose in an oxygen deficient atmosphere. Parts leave the oven completely dry and ash residue is easily removed. 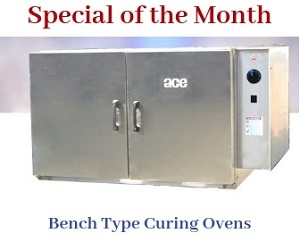 The ACE Oven is fabricated from 11 gauge steel and coated with a high temperature, rust resistant paint. The oven and self-supporting exhaust stack is lined by 4 inches of high temperature insulation rated at 2,300°F (1,260°C). This aids the oven to provide maximum energy efficiency. Radiant Tube Heater for Improved Overall Heating: With RT series, we have introduced the one of a kind radiant tube heater, which utilizes radiant plus convection heat. The radiant tube directs the radiant energy upward. The radiant tube is located under the oven cart. It is positioned in the center of the oven and extends from the back wall to oven door. A gas burner fires directly into the length of the radiant tube. Convection heat evenly comes out the numerous holes on the left and right side along the entire length of the radiant tube. Radiant energy is also evenly emitted along the entire length of the radiant tube. This results in consequent heat extraction efficiency of 90%. This in turn allows the over to heat even in the harshest environment. High Fire Afterburner Chamber for No-Pollution Heat Cleaning: The integral high fire afterburner chamber is designed to provide excess air for complete combustion of the smoke. Discharges to the atmosphere are harmless by-products of combustion. The RT Series Burn Off Ovens also conform to tough EPA air emission standards. One Touch Control (OTC) for Effortless Control and Monitoring: One Touch Control is a new automatic self-adjusting control system. It monitors the combustible vapor in the oven and controls them at a safe level. As the operator is not required to make any program selection, thus eliminating the possibility of operator error. This is an accurate, simple, yet highly effective system to automatically provide the shortest possible safe heat cleaning cycle times. The OTC system automatically self-adjusts the cycle time to the weight of the non-combustible and combustible load. Naturally, lighter combustible loads automatically take less processing cycle time than heavier combustible loads. The automatic self-adjusting system permits no margin of error for over or under processing. It does not require an experienced operator to select a menu or estimate the amount of combustible material in the load. One just needs to touch the start button, and let the OTC do the work for any size load. Door Locking Feature for Enhanced Safety: The thick door is securely sealed by husky cam type latching mechanisms located on the top and bottom of the door. For reasons of safety, the latch is designed to accept a lock, as the door should not be opened during the heating cycle. With the aforementioned features, the new RT Series Burn Off Ovens overshadows rest of the heat cleaning ovens available on the market. Call us at 800-255-1241 or email your enquiries at sheran@armaturecoil.com.